The shores of lovely Burgeaux Bay on St. Maarten's Dutch side are home to magnificent Casa Boco Villa. 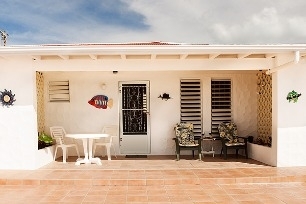 Mullet and Maho beaches are a short distance from this one of a kind St. Maarten vacation villa . For the discriminating Caribbean traveler, this is an experience in island luxury not soon to be forgotten. This villa is perfect for a family or a group of friends to get together and enjoy each other for a wonderful vacation experience. The studio rentals are complete with a small kitchenette, cable tv, private bath, and patio. It is equipped with coffee maker, microwave, cooktop, pots dishes and other necessities to make this a very comfortable complete studio apartment. 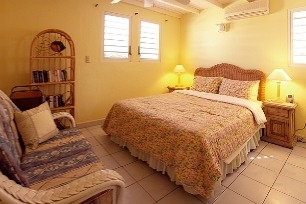 Both the Casa Boco main house and guest studios are air conditioned for your comfort. This is your ourside living and cining room. 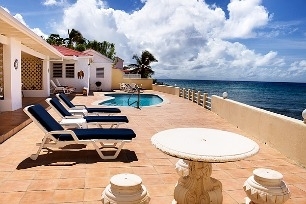 This tastefully decorated, upscale St. Maarten villa sits directly on the waterfront of sparkling Burgeaux Bay. Casa Boco serves up all the necessities, luxuries, and privacy that a weary world traveler could hope for. This Villalady exclusive is one of the most sought after accommodations on the exotic Dutch side of St. Maarten and includes a private swimming pool and a 100 foot deck. The views of the sunset are magnificant and different every evening. One block down from this St. Maarten villa masterpiece is a public walkway to the beach. The activites at the maho Beach and a few steps further down the road. It's time to let go, unwind, and drink in the remarkable Caribbean sunsets sinking into the shimmering ocean of St. Maarten's Burgeaux Bay . Unwind on the dock with a cocktail or enjoy a late evening dinner outside on the private deck with someone you care about. You've earned this little slice of heaven in the exotic Caribbean islands. This St. Maarten oceanfront villa is the essence of elegant island style. So Many Possibilities at Casa Boco: Reserve the Whole Five Bedroom St. Maarten Villa, the Main House with three bedrooms, or one of the cozy studios for two. 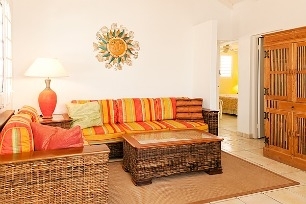 The entire St. Maarten vacation home can be enjoyed as a five bedroom villa for up to 10 island visitors. The main house's three bedroom suites are home to a roomy king and two queen beds. Studio apartments include either a king or double twin beds. For the extra overnight guest, a blow-up mattress is on hand. The Casa Boco main house showcases a huge combo kitchen and living area for a whole crowd of relaxed vacationers to hang out in. 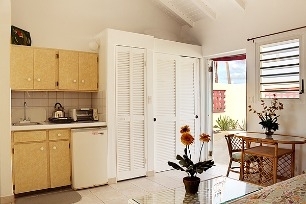 The villa kitchen includes modern appliances, dinnerware, and cookware, along with the very convenient washer and dryer. Additional charge of 40.00 weekly for unlimited internet usage. Please advise. Please add $50.00 per day for extra people over the maximum of 10.